Pain relief, detox, and calorie burning. If you’re like most people, these are the only infrared therapy health benefits you’re aware of. Infrared light therapy (also known as Photobiomodulation) has more than 13 mind-blowing, scientifically proven health benefits and (safe) uses, most of them you’ve never heard of. These days, you can safely use infrared therapy technology (also known as MIRE therapy – monochromatic infrared light energy) at home, any time you need it. Exactly how to use IR therapy to treat anything from Arthritis pain to hypertension, chronic fatigue, and weight loss – at your home. 1 What is Infrared Light Therapy? What is Infrared Light Therapy? The natural, non-invasive and painless Infrared light therapy, also known as Low-Level Laser (LLLT) and photobiomodulation, is experienced by us as heat and is the invisible part of the sun’s light spectrum. It’s the heat you feel when you get in your car after it’s been parking outside. It’s the warmth you feel on your skin when you relax on the beach. In 2019, Infrared (IR) technology advances allow you to enjoy the amazing health benefits of sunbathing – without the skin-damaging UV radiation. Did you know? Infrared rays (700 nm – 1050 nm, frequency 430 THz) are so safe that it’s used to warm babies in the NICU. 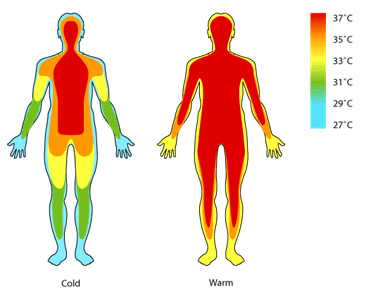 What Does Infrared Heat DO to Your Body? Infrared light penetrates deep into your body (2-7 cm) all the way to the inner layers of your skin, to your muscles, nerves, and bones. IR then boosts local blood circulation, which brings more healing nutrients and pain-relieving components to the area, while promoting a detoxifying sweat. Research in the last decades has proven that this particular frequency of light offers a powerful healing boost to your body on a cellular level. Below you’ll discover the complete list of science-backed health benefits of infrared therapy and the staggering amount of infrared heat health uses available to you today. Near and Far infrared therapy technology allows you to harness all the powerful benefits of the sun – without being exposed to UV light and without any side effects. In fact, it’s so safe it’s used to keep babies warm in the NICU, and our bodies naturally radiate it! Ready to know every way in which you can use infrared light therapy? Science has proven beyond any doubt that infrared light therapy is a safe, drug-free and effective method for long-lasting pain relief and injury-healing – anywhere in your body. World-class athletes (Tiger Woods is one of them) have been using it for years to quickly recover from sports injuries. Doctors use it, physical therapists use it and of course – acupuncturists (mainly via TDP lamps like this one). There are multiple ways to use infrared therapy to relieve pain at home, depending on your health condition and treatment area size. 👉 For back pain, I’d recommend a jade/amethyst infrared heating pad/mat. 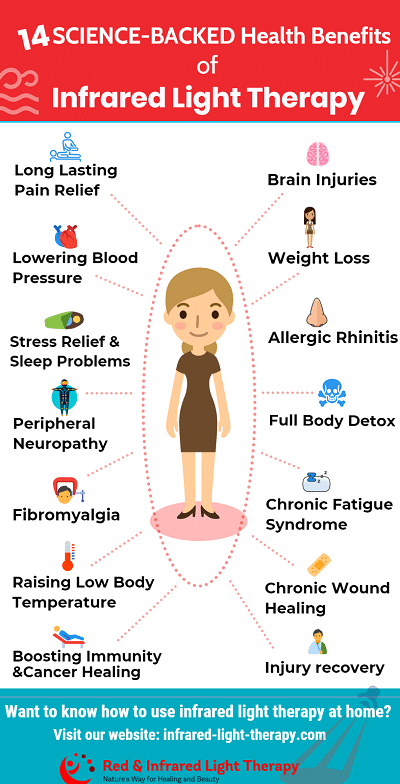 👉 For Fibromyalgia pain I’d recommend a home infrared sauna – to treat your entire body at once while detoxing from toxins at the same time. Confused about the RIGHT Device for Your Needs? Download your FREE PDF – “Which Device do I Need?” – and find out the best device for your specific condition – Right Now! 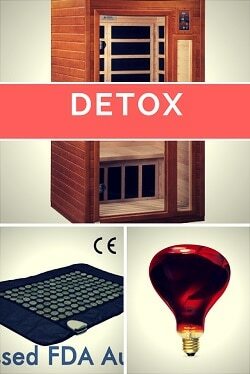 Infrared saunas are considered 7 times more effective at detoxifying heavy metals and other environmental toxins. Infrared sauna treatments heat your body directly, inducing a rise in your core temperature. A deep sweat at a cellular level, where toxins reside (such as cadmium, lead, and mercury). Enhanced metabolism, blood circulation, and tissue oxygenation. Toxin detoxification can be extremely helpful for Fibromyalgia, Lyme Disease, chronic fatigue, colitis, any auto-immune disease, and even ADHD. These amazing results are produced at lower temperatures than a traditional steam sauna and can be much better tolerated by people who can’t withstand the high heat of steam rooms. Lady Gaga has recently shared how she uses an infrared sauna to deal with her chronic back pain, and also describes it as an effective detox and weight loss tool. Portable infrared sauna/dome – a portable infrared sauna is less costly, and you can keep your head out during treatment, which many people like. 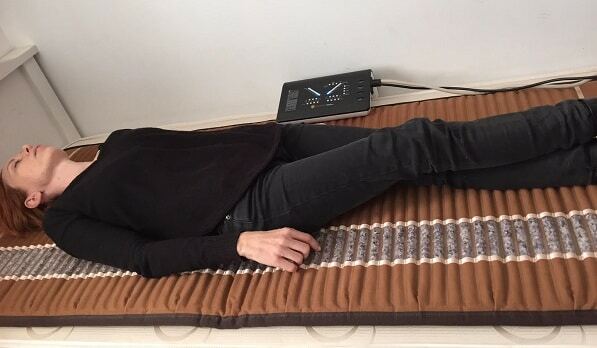 The Amethyst Biomat – lie on it and use a blanket to keep the heat. Turn to the other side after at least 30 minutes. From personal experience, I can say that the Biomat is amazing. First: While you relax in an infrared sauna, your body is actually working hard. It’s working to produce a lot of sweat. This hard “work” results with calorie burning. According to a Journal of the American Medical Association report, you can burn as many calories as you would be jogging or rowing (200 – 600 calories) – in a single far infrared sauna session. You will also lose “water weight” from sweating so much. You’ll gain back the “water weight” once you hydrate. A two-phase sauna weight loss study (conducted by Binghamton University in NY) found that increasing your body temperature results in a decrease in body fat. In the study, participants who used an infrared sauna 3 times a week for 30 minutes – dropped an average of 4% body fat over a four-month period. For a 175-pound man, that represents a weight reduction of 7 pounds. Control groups showed no drop in weight. 👉 Infrared sauna treatments – you can get them at your local spas, but purchasing your own FIR sauna will save you a ton of money in long-term (this is the best one for its cost). Remember to drink up before, during and after – no exceptions! If you want to reduce cellulite – go for red light therapy. Here’s how to use LLLT to reduce cellulite. How does your body react when it is fighting viruses and bacteria? 1. Because raising your core body temperature boosts your immunity (by producing more white blood cells), while creating a heated environment in which bacteria can’t survive. 2. Because heating your body also causes blood vessel dilation, which enhances circulation and oxygen delivery throughout your body. So, what do you do when you feel like you’re coming down with a cold or flu? 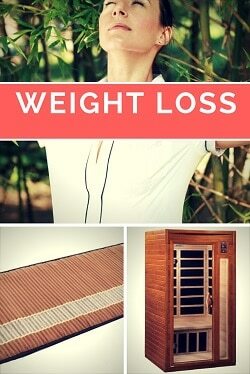 You hit the infrared sauna to rally your body’s natural defenses. 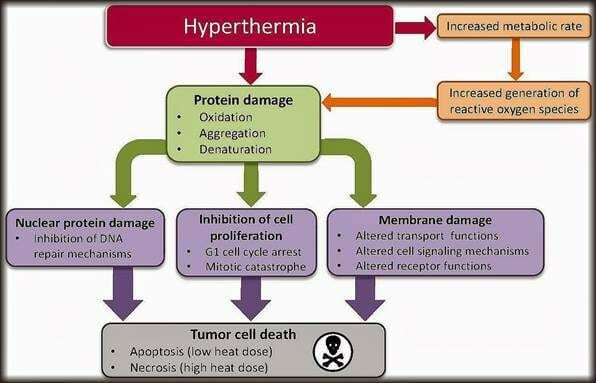 Raising core body temperature has been proven many times to inhibit the proliferation of certain cancer cells (including breast, lung, and tongue cancer), according to Medical Oncology in London. According to Dr. Mark Sircus, best-selling author of many allopathic medicine books, the easiest, safest and most effective way of treating most disease, including cancer, is to increase body temperature with infrared therapy. As you probably know, 98,6 F is considered the ideal body temperature for optimal health. It helps maintain optimal blood circulation, vitality, and strong immune system. According to this study, Low body temperature is one of the little-known causes of obesity. Why? because Lower body temperature = slower metabolism. World-class athletes (Tiger Woods is one of them) have been using phototherapy to speed up recovery from sports injuries for many years. Physiotherapists and sports medicine specialists are well aware of the many studies proving that phototherapy reduces pain and inflammation caused by muscle injuries, spine injuries, and even broken bones. Using IR for injury recovery at home depends on the treatment area size and structure. 👉 Here are the 3 best infrared knee heating pads for knee injuries and chronic pain. According to many studies, cells exposed to near-infrared light (energy just outside the visible range) from LEDs – grow 150% to 200% faster than cells not stimulated by this light. Near-infrared wavelength increases microcirculation and formation of new capillaries. 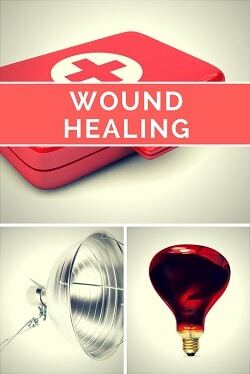 The wound area receives more oxygen and nutrients to help with the natural wound healing process. How can one hour of FIR therapy effect high blood pressure? According to medical researchers from Germany, one hour inside an infrared sauna can significantly reduce your BP levels, total peripheral resistance, and cardiac ejection resistance. According to the journal of the American Medical Association, infrared heat therapy lowers BP by promoting the same physiological process which happens when you do aerobic exercise. Your core body temperature slowly rises and stimulates blood vessel dilation. This results with increased blood flow, heart rate, and cardiac output – without you moving a muscle. It’s exercising to reduce your blood pressure – without exercising. Any active symptoms such as chest pain or shortness of breath that would cause a person to avoid moderate exercise would also be a reason to avoid an infrared sauna. infrared sauna treatments – here are the 3 best infrared home saunas – reviewed and compared. 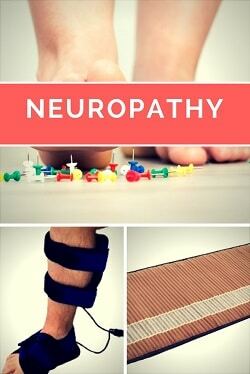 Can low-level laser therapy relieve your Neuropathy symptoms? Can it stop the numbing, the burning, tingling and excruciating pain – without any side effects? In fact, this simple technology (also known as MIRE therapy – monochromatic infrared light energy) is proven to be the most effective drug-free pain relief available. The key to the dramatic relief you’ll experience is nitric oxide. Nitric oxide is a short-lived gas that is crucial to the health of your arteries. This powerful signaling molecule relaxes them, regulates blood pressure, fights free radicals and prevents platelets from clumping together. Infrared light therapy prompts the release of nitric oxide, which enhances blood flow, brings oxygen nutrients and pain relieving components – to your tissues and nerves. See exactly how to use infrared therapy to relieve your nerve pain and restore nerve function – in this post. Muscle relaxation, pain relief, and mental clarity. Infrared therapy is proven to balance your Cortisol (“stress hormone”) levels. Ryotokuji et al. indicated that four weeks of FIR radiation administered to the feet of type 2 DM patients significantly reduced cortisol levels and blood glucose levels. Infrared rays penetrate your body and promote muscle relaxation and endorphin (“feel good hormones”) release. Repeated infrared sauna session (or Biomat treatments) over several weeks can reduce stress levels long after you’ve finished treatment. I’ve found many people reporting a feeling of well being, improved sleep and greater peace of mind. To manage stress levels and sleep problems, use either a portable home infrared sauna or the Amethyst Biomat. Science is just starting to investigate the effect of infrared heat therapy on Chronic Fatigue Syndrome. On a scale of 1 to 10, the average level of fatigue was reduced from 6.7 to 4.8. Negative mood, including anxiety and depression, significantly improved after therapy. The heat from infrared saunas is powerful and deep, yet surprisingly gentle and easy to tolerate at the same time. Use an infrared sauna or portable IR sauna for 15 minutes every day, followed by 30-minute rest under a few blankets – along with a large glass of purified water. Infrared saunas have been shown to reduce Fibromyalgia pain (and other symptoms) up to 78% (source). The infrared heat is especially good for people with Fibro because the heat is powerful and deep, yet surprisingly gentle and easy to tolerate. Infrared heating pads – can be used for localized pain. I recommend the UTK Infrared heating pads – see my full review HERE. 5 recent studies found that near-infrared light regenerates damage for Traumatic Brain Injury (TBI) by reversing inflammation, oxidative stress, and neurodegeneration. With millions of TBI survivors and various other possible applications for NILT, this is one of the hottest topics in neuroscience today. 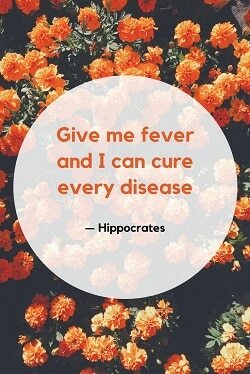 Hay fever symptoms occur due to inflammation in the nose when your immune system “overreacts” to allergens in the air. In this 2007 study, A WS TY101 FIR emitter was placed to face the patients’ nasal region at a distance of 30 cm. The treatment was performed for 40 min every morning for 7 days. The symptoms of eye itching, nasal itching, nasal stuffiness, rhinorrhea, and sneezing were all significantly improved. No adverse side effects were recorded. 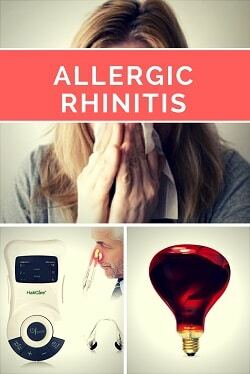 You can use IAT (infrared allergy treatment) at home via a special infrared light therapy nostril device (a “nasal warmer”). After a few sessions with IAT, allergy symptoms can begin to ease and can be successfully managed. Every year more scientific research proves IR amazing health benefits and uses – all of them can be used safely at home. 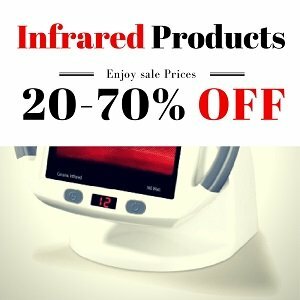 Make sure to browse around the site because we have researched and recommend the safest, highest quality infrared light therapy products on the market. Feel free to contact us if you feel you need a personalized recommendation for your needs. Use the comment section to ask us anything, we answer everyone. Your comment regarding the use of IR for the treatment of cancer is misleading. The temperature increases in the body after low level light therapy are not significant enough to cause the temperature changes that the ACS propose. 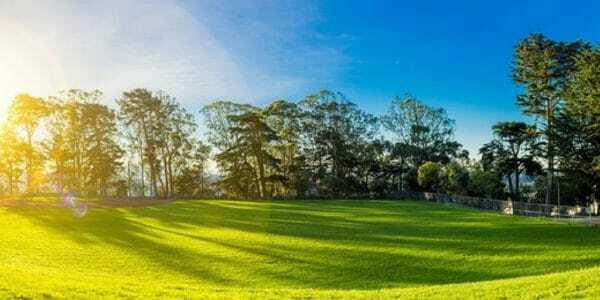 The temperature changes that the ACS talk about are generally produced by ablative lasers and follow the principles of photothermalysis, whereas you are describing photobiomodulation a very different technique and effect on the cell. In addition, you talk of photoimmunotherapy raising body core temperature. This is completely incorrect. Photoimmunotherapy as your own link states is a combination of monoclonal antibody tied to a photosensitizer and is not related to raising core temperature. Thanks for your comment Steve. However, I have not mentioned photoimmunotherapy anywhere in the article, nor did I claim that infrared light therapy cures cancer. But, There is no doubt that infrared heat therapy increases core body temperature if used aggressively enough. There is no doubt that increased body temperature is correlated mathematically with increased immune system strength. Maybe I should rewrite this section so Its better understood. Thanks again for your comment. Hi, I would like to ask whether LED facial mask would actually worsen hyperpigmentation? I have actually heard a few saying that after continuous use it had darken the shade of their skin and darken some of the hyperpigmentation spot that they originally intended to remove. Also, can I use it after micro needing? 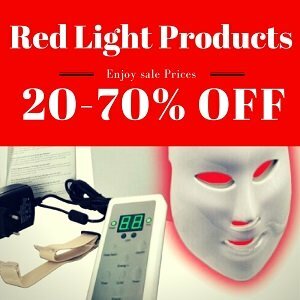 Red light therapy is not supposed to worsen hyperpigmentation, but what I’ve heard from people is that sometimes it appears to be worse but if you continue treatment it improves overall condition. I wouldn’t use it after micro needing, I would allow the skin to heal at least for a couple days before treating it with something else. Can you provide some links as to how infrared light helps with digestion and gall bladder function? As for digestion, FIR works via promoting blood circulation throughout the body – which increases any body function, including digestion and metabolism. As a massage therapist, I am looking for an infrared light therapy device that would be simple to use, not heavy to carry around and would be effective for my clients’ aches, pains, arthritis, muscle strains & sprains, inflammation etc. What device would you recommend? And, would this be an effective modality to use for such things on clients? Yes, it can be helpful for your clients. You can give them the massage while they are lying on an infrared heating mat. My best recommendation is the BioMat, which I own and love, and covers my entire body. I have read that light therapy should not be used while taking an immune suppressant drug. Can you explain why? I haven’t heard about it, but I can say that any drug that its side effect is light sensitivity, can not by used along with light therapy. If a certain immune suppressant drug causes light sensitivity, it would be best to avoid exposure to light. I hope this helps. To my knowledge, if you keep it at a safe distance than yes. At least 24 inches away. What if you spend time in a traditional sauna ? Instead of infrared. Will it have the same benefits ? And what about steam rooms ? You will have some of the benefits in a traditional sauna, especially the detox effect. However you may not get the pain relieving benefits of the deep penetrating infrared rays. Same goes for the steam room. If you use the portable sauna does that mean that your face would not receive any benefits because it was not exposed directly to the infrared? Generally, you would be right, but since the entire body’s blood circulation is boosted during the treatment – this improved blood flow will get to the face as well – bringing nutrients and promoting collagen production in the face as well. Can you use a handheld unit on your face and neck? Thanks so much for this wonderful article. It is answering 99.9% of my questions! Yes, you can use it on the face and neck. Enjoy!